Owen Maclaren is best known for his innovative design of a lightweight folding baby carrier. However, his earlier design work for the aeronautical industry, proved vital for the war in the air, during the Second World War. He designed the undercarriage of the famous Spitfire, which contributed significantly to the Allies war effort. He had been a test pilot for the Supermarine Spitfire. The new undercarriage design, allowed the plane to manoeuver whilst on the ground. 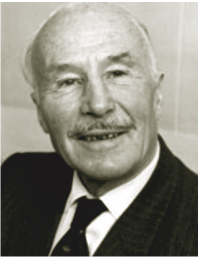 In 1944 he founded a company manufacturing aircraft parts, mainly for the thriving British Aeronautical industry. As a designer and innovator, he was always looking for problems to solve. He saw an opportunity to apply his skills, when watching his daughter struggling with a child’s push chair. Existing push chairs were heavy and very difficult to lift and manouevre and lacked style. Owen Maclaren, looked at the problem from that of a designer and experienced engineer. Whilst working in the aeronautical industry, he worked with modern lightweight materials such as aluminium, due to the weight restrictions of fighter planes. He applied his knowledge of folding lightweight tubular structures, to that of children’s push chairs. In 1965 he patented his design of the B01 and it reached the shops in 1967. This was the inspiration for many folding products that followed. He designed the ‘Gadabout Folding Chair, which was also a walking stick. In 1961 he designed a large buggy for the Ministry of Health. 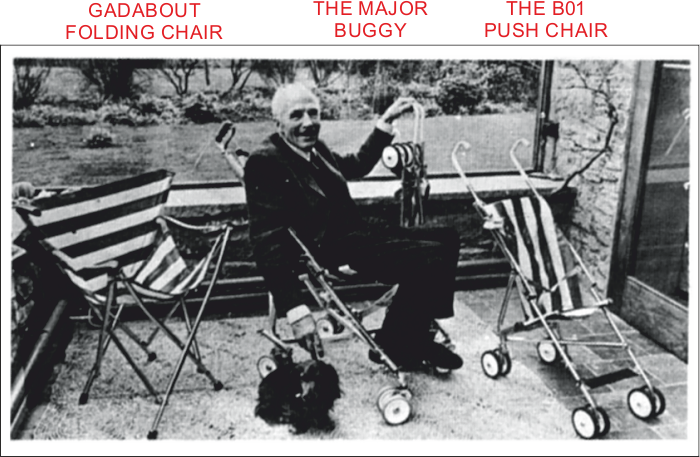 This was for very young disabled children and consequently, it was larger and became known as the ‘Buggy Major’. Compared to the Maclaren B01, its is heavy and difficult to manoeuvre. It does not fold down to a manageable size. The wheels are large, making turning round in a tight area very difficult. Also it was very difficult to pick up due to its weight, size and rigid form. The Maclaren is lightweight due to its aluminium structure. 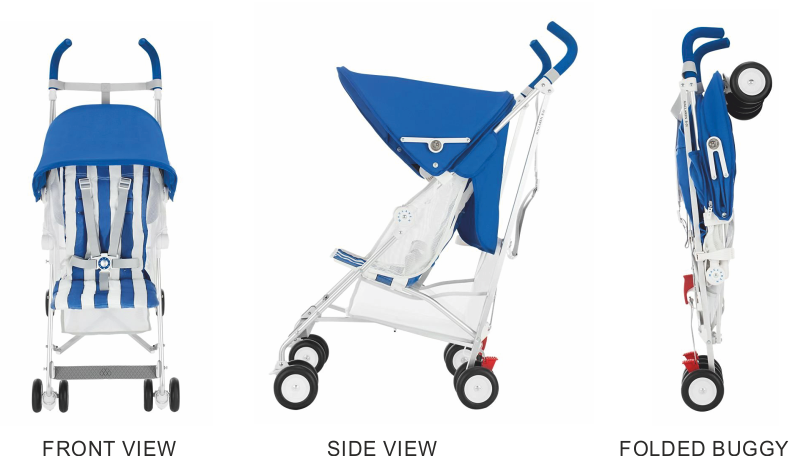 It folds to a manageable size because of innovative design and can be carried by one hand. Ideal for getting on and off buses or folding and placing in a car boot. Owen Maclaren, pictured here with three of his famous folding products. 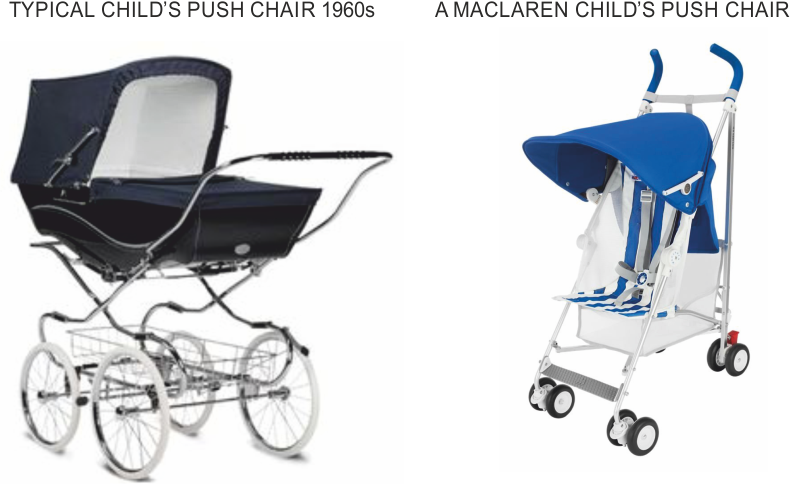 The folding push chair called the ‘Gadabout’ Folding Chair (1961), the Major Buggy and the famous folding B01 push chair .